Includes bibliographical references (p. 278-285) and index. 1990-09-05. New. Ships with Tracking Number! INTERNATIONAL WORLDWIDE Shipping available. Buy with confidence, excellent customer service! 2007-05-08. New. Ships with Tracking Number! INTERNATIONAL WORLDWIDE Shipping available. Buy with confidence, excellent customer service! Harper. MASS MARKET PAPERBACK. 0380758903 Very Good Condition. Five star seller - Buy with confidence! . Very Good. Harper. MASS MARKET PAPERBACK. 0380758903 Good Condition. Five star seller - Ships Quickly - Buy with confidence! . Good. Harper. MASS MARKET PAPERBACK. 0380758903 **Has heavy crinkling and staining** Meets the acceptable condition guidelines. Has wear. Five star seller - Buy with confidence! . Fair. US: Harper, 1990. Harper 1990 Fine/ Pos penned inside cover o/w New. Unread.. Mass Market Paperback. Fine. 1990-09-05. Good. Ships with Tracking Number! INTERNATIONAL WORLDWIDE Shipping available. May not contain Access Codes or Supplements. May be ex-library. Shipping & Handling by region. Buy with confidence, excellent customer service! Harper. Used - Good. Ships from the UK. Former Library book. Shows some signs of wear, and may have some markings on the inside. 100% Money Back Guarantee. Your purchase also supports literacy charities. Bear & Company, 1990-09-01. Hardcover. Used:Good. Santa Fe: Bear & Company Inc., 1990. ** THE FOURTH BOOK OF THE EARTH CHRONICLES ** The Bear & Company edition of 'The Lost Realms' is the first hardcover edition of this book. It was previously published in paperback by Avon in 1990. Hardcover with dust jacket, 298 pages with illustrations. A former library book withdrawn with stamps, sticker residue etc. The interior appears to be clean and the book has minor wear - packed with care, prompt reliable dispatch. . Hard Cover. Acceptable/Good. 8vo - over 7¾" - 9¾" Tall.. Ex-Library..
Bear & Company. Hardcover. 093968084X Special order direct from the distributor . New. Bear & Company. Hardcover. 093968084X . New. Harper, 1990-02-01. Mass Market Paperback. Good. Bear & Company. Hardcover. 093968084X Remainder mark . Fine. Harper, 1990-02-01. Mass Market Paperback. Used:Good. Santa Fe, NM: Bear & Co., 1990. Condition: GOOD only. Spine cocked, top edges of boards faded, upper corners of boards bumped with front corner splitting, lower corners of boards lightly bumped, first several page corners bumped, some soiling to endpapers. Text clean and unmarked. Lacks jacket. Reprint. 298 pp. Size: 8vo. Hardcover. Good/No Jacket. Harper, 2007-03-27. Mass Market Paperback. Used:Good. Bear & Company. Hardcover. 093968084X *LIKE NEW* Ships Same Day or Next! . Fine. Bear & Company. Hardcover. 093968084X *BRAND NEW* Ships Same Day or Next! . New. Santa Fe, New Mexico, U.S.A.: Bear & Co, 1990 298pp. Tight copy in dust jacket.. Hardcover. Fine/Very Good. SANTE FE: BEAR AND CO, 1990. THIS IS A GOOD UNMARKED COPY OF THIS SCARCE AND IMPORTANT VOLUME...WRITTEN BY THE LATE ZECHARIA SITCHIN.....THE LOST REALMS....THE FOURTH OF THE EARTH CHRONICLES...A NICE UNMARKED COPY HOWEVER THE PAGES HAVE A CRINKLING. First Edition. HARDBOUND. Good/Good. Illus. by ILLUSTRATED. OCTAVO. 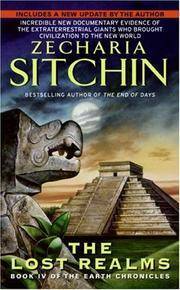 ZECHARIA SITCHIN. Bear & Company, 1990-09-01. Hardcover. Good. Bear & Company, 1990-09-01. 16378th. Hardcover. Good. Bear & Co, 1990. Hardcover. Good. Hardcover. Sound & good copy, light to moderate edgewear, stamped. Jacket has light to moderate rubbing/edgewear. Not price clipped. Bear & Co.. Hardcover. Used Near Fine/Very Good. Mass Market and Trade Paperback May have minor wear to edges or light bumping, but overall a clean and crisp copy. Hardcover may have light wear to jacket edges, not price-clipped. Book clean, tight, unmarked. NY: Harper/Harper Collins Publishers. Very Good. 2007. Paperback. Almost like new condition. Very lightly handled. Unmarked. ; 16mo 6" - 7" tall; 298 pages . Harper, 2007-04-01. Mass Market Paperback. Good. Harper. Used - Good. Shows some signs of wear, and may have some markings on the inside. Harper. Used - Very Good. Former Library book. Great condition for a used book! Minimal wear. Harper Collins, 2007. Paperback. New. "...In the sixteenth century, Spanish conquerors came to the New World in search of El Dorado, the fabled city of gold. By Zecharia Sitchin." Harper. MASS MARKET PAPERBACK. 0061379255 Special order direct from the distributor . New. Harper. MASS MARKET PAPERBACK. 0380758903 Item in good condition. Textbooks may not include supplemental items i.e. CDs, access codes etc... . Good. NY: Harper/Harper Collins Publishers. Very Good. 1990. Nineteenth Printing. Paperback. BLOCKED BY AMAZON. Almost like new condition. ; 16mo 6" - 7" tall; 298 pages . Mass Market Paperback. Good. Good used condition, shows average signs of use or wear for its age. Ships fast & secure, expedited available! Harper, 1/1/1990. Mass Market Paperback. Very Good. Paperback book in good condition. Harper. Used - Very Good. Ships from Reno, NV. Former Library book. Great condition for a used book! Minimal wear. 100% Money Back Guarantee. Shipped to over one million happy customers. Your purchase benefits world literacy! U.S.A.: Harper, 2075. Book. Good. Soft cover. mass market paperback, good reading copy, small tear along front edge of cover. Harper. MASS MARKET PAPERBACK. 0061379255 *BRAND NEW* Ships Same Day or Next! . New. Harper. MASS MARKET PAPERBACK. 0061379255 *LIKE NEW* Ships Same Day or Next! . Fine. Harper. MASS MARKET PAPERBACK. 0061379255 . Fine. Avon. 2nd printing,1990. Fair paperback. 16mo,paperback,298pp,illus. spine creases,corners worn,edgewear,rubbing,scratches,cover. yellowing,clean,text with gutter stressed. ufo's.